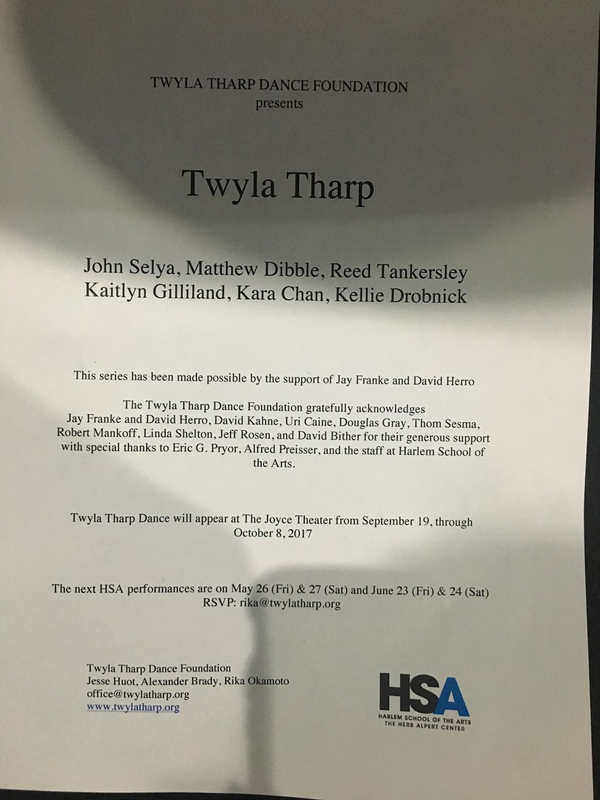 On Friday, April 28th, I went to see a performance of Twyla at Black Box, at The Harlem School of The Arts, presented by the Twyla Tharp Dance Foundation. This was the first performance of Twyla Tharp’s black box series, where two evenings a month in April, May, and June, Ms. Tharp presents some of her newest, in – progress, work in an informal format. The show will change each month as Ms. Tharp’s choreography progresses. Dancers in this performance included Twyla Tharp, John Selya, Matthew Dibble, Reed Tankersley, Kaitlyn Gilliland, Kara Chan, Kellie Drobnick, and some audience members! According to the event’s facebook page,“It’s a fly on the wall format, it will provide an experience of making dance not ordinarily available to an audience,” and the evening did not fail to deliver on this promise! Everything about this event, from the publicity (a couple of Facebook posts) to the finale, was atypical of a performance by such a world famous choreographer. Arriving at the Harlem School of The Arts, I found a line formed at a side door leading directly into the black box theater. There, Rika Okamoto (of the Twyla Tharp Dance Foundation and a Twyla Tharp dancer for over two decades) checked my name off her list. I put my $5 “suggested donation” in a bucket (what a steal!) and took my seat. I was startled when, instead of music, lights, or costumed dancers, Twyla Tharp began the show, appearing onstage in a baggy, gray, sweat suit and white sneakers. She explained that she and the dancers would show us what they have been working on for the past four weeks. The first piece started with what seemed to be a demonstration of the rehearsal process. Ms. Tharp gave directions, demonstrated the movement physically, and then the dancers tried it to music, which was an upbeat version of the traditional gospel blues song, “Ain’t Nobody Hide From God” (there was no written program provided to the audience, so I am unsure of the singer). The dancing was jovial and social , but still technically driven, with many impressive kicks, jumps, and turns. The dancers’ smiles seemed genuine and they each wore what looked to be their normal rehearsal clothing (leotards, leggings, t- shirts, bandanas, etc.). Next, the music and the movement became more serious, with less partner work and more presentational gestures. A dancer not seen onstage yet, John Selya, peeked out from the wing. He made his way onto the stage and observed the other dancers with an anxious look on his face. Suddenly, the music stopped, and Ms. Tharp appeared onstage while the other dancers exited. Only Mr. Selya remained onstage with Ms. Tharp. Cheerful music began to play, and Ms. Tharp and Mr. Selya (now known to be the character “Harris”) did a silly number involving a hat, with Ms. Tharp mimicking Harris’s gestures. The two left the stage, and the rest of the dancers returned and did some beautiful, modern/ballet to a fast – paced piece by Bach. The rest of the piece continued with these same three motifs: dancers only, dancers and Harris, and Harris and Ms. Tharp. Harris seemed to be caught in the middle, struggling to make sense of everything that was happening on the stage (as most of us in the room were). There were many scenes in this first piece. Some were interesting, while others were forgettable. One of my favorites was a scene in which Ms. Tharp and Harris seemed to have some sort of physical “conversation” about time (ripping a paper clock and doing the “time step”). Also, any scene in which Kaitlyn Gilliland and Matthew Dibble had a prominent role stood out to me. It’s impossible to watch anything else when these two are onstage due to their flawless technique, which is both graceful and sharply powerful. This piece certainly had a narrative, but its meaning was not overtly apparent on the surface. Luckily, after it was finished, Twyla Tharp came back onstage and explained the narrative, scene by scene, to the audience. Here are some highlights of that explanation. Ms. Tharp explained that her character is called Ed (though I do not think that this name was ever mentioned in the piece) and that Ed had a problem with the language of dance. Thus the question, “Which came first, the chicken or the egg?” was really asking, “Which came first, language or dance?” Harris tried to explain the language of dance to Ed through time. To aid in this explanation, he used the clock, the time step, two poles to represent “tick and tock,” and the music of Bach. Meanwhile, Harris had his own problems, as he was a man hiding from God (God was represented by dancer Kaitlyn Gilliland, who often was seen taking a role of power over the other dancers). Ms. Tharp ended her explanation of the piece by telling us that at the show next month in May, this story will continue and begin to discuss mortality. Next, Ms. Tharp introduced the second piece of the evening. This was preview of her choreography, set to seven Bob Dylan songs, that will premiere at The Joyce Theater this September. The movement, a seamless mix of folk dances, modern, and ballet, worked because it did not try too hard to match the lyrics of Dylan. Rather than trying to fit her art into Dylan’s, Tharp let the strength of her ideas and the skill and personality of her dancers shine, with Dylan’s music accompanying them, rather than the other way around. For the finale, Ms. Tharp asked for six volunteers to each learn an eleven second piece of choreography from her famous work The One Hundreds (which premiered in 1970), from one of the dancers, in exchange for a donation to The Harlem School of The Arts. While the dancers worked with the volunteers, Ms. Tharp took questions from the audience. Here are some highlights from that Q & A.
Q: Which did come first, language or dance? A: “No painting, no poetry, no music, until we move out. Dance, Dance, Dance!” (my new favorite quote). Q: What excites you about dancers? Q: Is there always a narrative in your work? Finally, the show ended with the volunteers each performing their eleven second dances all together twice, first as a run through, and then as their “official” performance. As we walked out, Tharp stayed around the stage and allowed people to go up and talk to her. I was way too intimidated, but maybe I will be braver next time. I will be back for the June performance (I will be away in May) and I urge you all to make it a priority to go as see this show!It is an incredible and rare experience to gain close access to one of the greatest choreographers alive today, to see her still dancing and moving agility (now in her 70s), and gain a peak into the mind of a genius. Furthermore, her dancers have an amazing combination of wit, agility, and dynamism that can only be fully appreciated up close in this unique setting. I’ll take this real and raw look at dance over fancy lighting, intricate costumes, and expensive tickets any day. 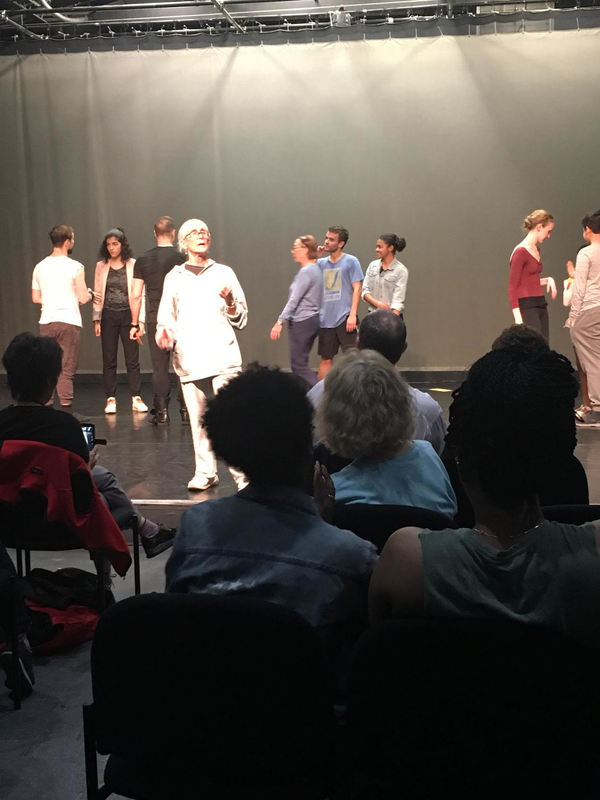 To reserve your seat for the May (26th & 27th or June (23rd & 24th) Twyla at Black Box shows at The Harlem School of The Arts, email rika@twylatharp.org.